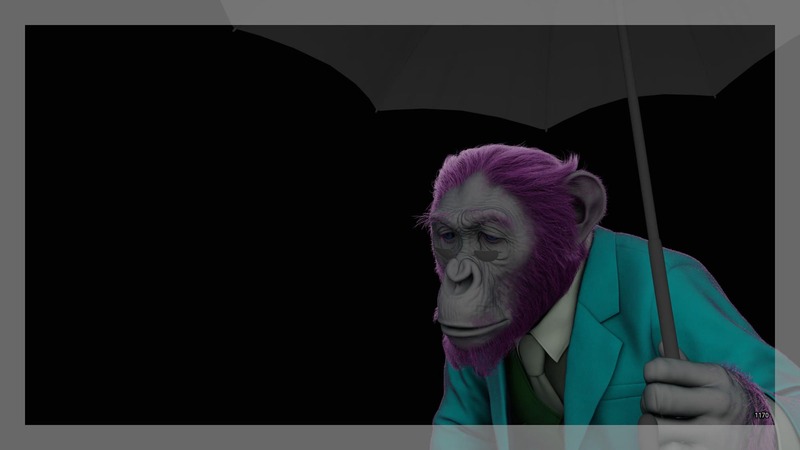 Dr. Phinneus Pogo is an advanced talking chimpanzee, who is both butler and friend of The Umbrella Academy's dysfunctional family. 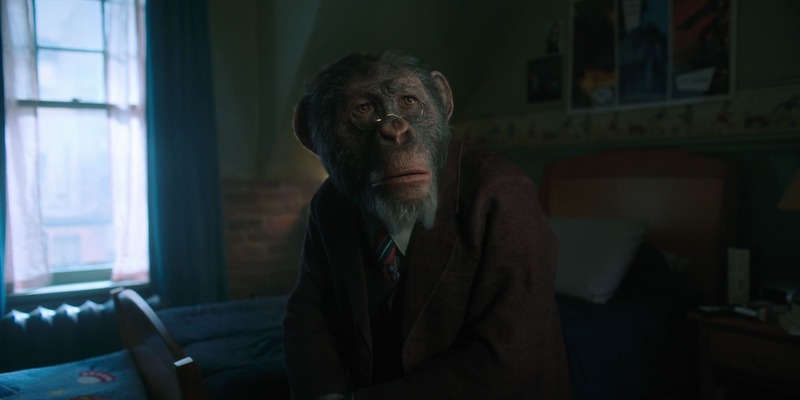 In the Netflix series, Pogo is voiced by British actor Adam Godley, who was the reference for the face of Pogo but on set Pogo was played by Ken Hall. 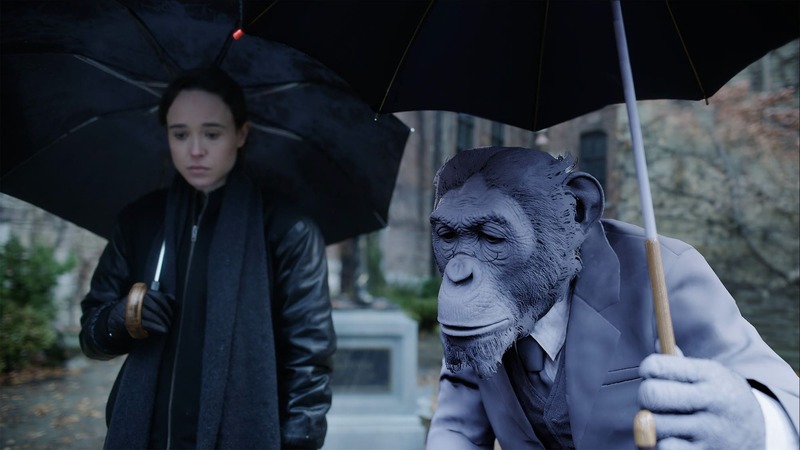 Chris White, Visual Effects Supervisor, supervised the Netflix series The Umbrella Academy, at Weta Digital where he is currently working on James Cameron's Avatar sequels. 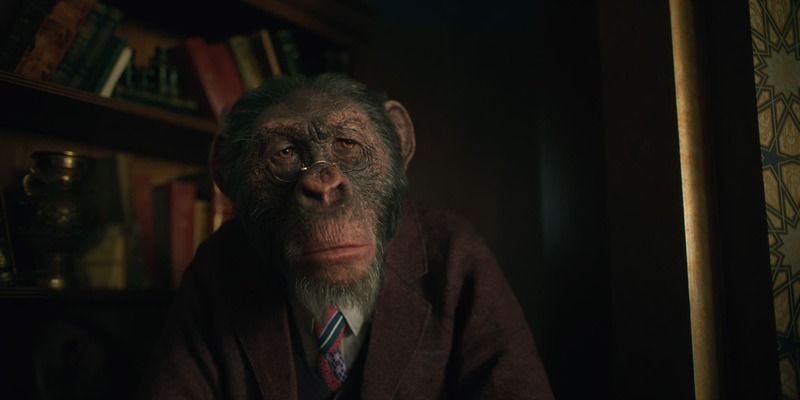 His work includes, Visual Effects Supervisor on both Rise of the Planet of the Apes and The Hobbit: An Unexpected Journey. Adam Godley provided the facial performance reference and voice of Pogo. Weta Digital handled the digital Pogo for the series and did all of the various shots of Pogo, who appeared in all but one of the final episodes. Weta did not do the other visual effects or environment work, except for occasions when Pogo was directly involved such as in his final death scene when he is impaled. 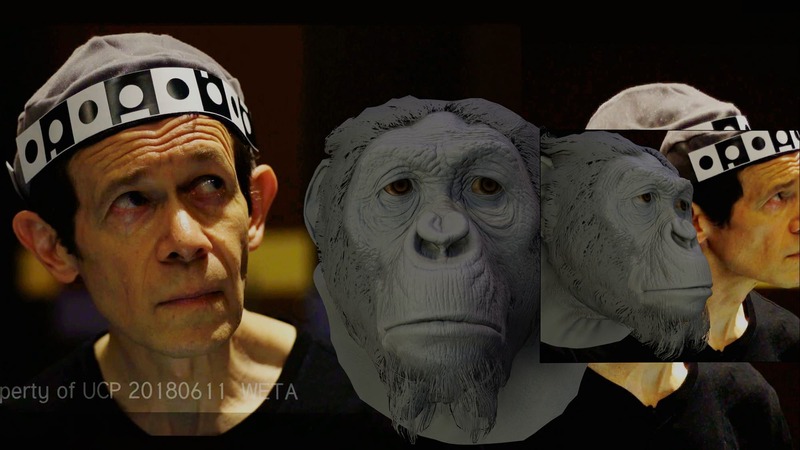 For his final scene, Weta was involved in the design of the scene. "We helped design his end pose and how he would hit the antlers", explained White adding, "I did a bit of practical effects research for all the blood and everything. I was trying to reference old films and figure out what the look would be for that". Pogos anatomy started with that of a real ape but it was a little modified so Pogo could stand more upright. Weta's team not only tried to match key poses and positions from the comics, but also to make Pogo match the plate photography. "We had initially sent through a test with him in his more natural posture, but he was just way too hunched over... and we also wanted to make sure his height and his eye-line matched Ken Hall, who was playing him, for interacting with the other actors on set". To match the height and to make sure Pogo wasn't too hunched over Weta gave Pogo a slightly more human anatomy. Adam Godley, who had previously worked with Weta on The BFG (2016), did the voice of the character. He was filmed with reference cameras during the recording of his ADR sessions. 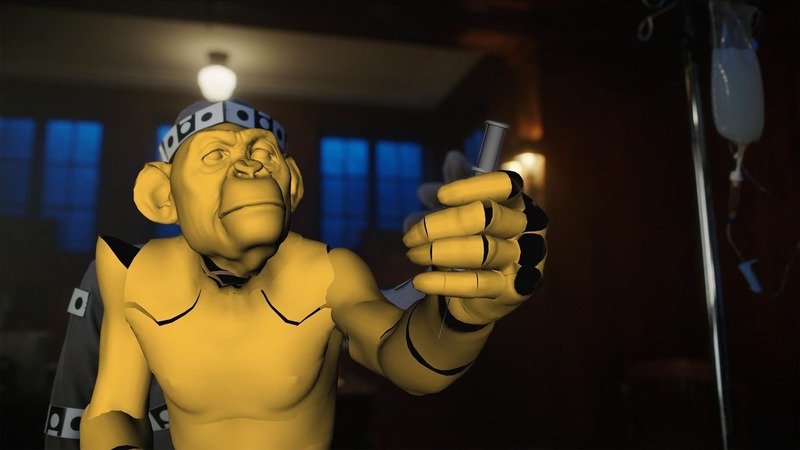 The animators then hand-animated Pogo's face to work with Pogo's body which had been animated to match that of Hall. The team did not use a head cam (HMC) or special facial capture technology. "We decided that would work best, but we did have to go back and recapture some of the motion to adjust the body to connect to the performance that Adam (Godley) was delivering. We didn't want that disconnect between what the head was doing, and the lines that he's delivering, and a completely different body motion" explained White. 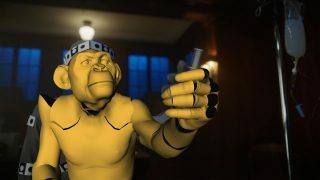 When the second unit went to re-capture Ken Hall, to match the dialogue's delivery, they put Adam Godley's performance on a monitor so Hall could time his movements to match. "It was almost like a three step process. It was Ken first, then Adam and then us recapturing and putting those together for the final program" he adds. Pogo wears glasses in the comics and White thought they were a very important character aspect to include with digital Pogo. The team suggested several variations of the glasses to the film makers and they settled on a clip on pair seen in the show. These were glasses Pogo could easily take off and on. The Weta team then had to carefully check Pogo's eyelashes did not intersect with the glasses geometry. Pogo was dressed thanks to a new procedural fabric model that Weta has developed. "It allowed us to really get down to the individual threads and every little aspect of how they were put together' White comments. White worked closely with the costume department and had samples sent to Weta. "Instead of in the past where you might have texture mapped all those details with fabrics, we brought him back here, put them under a microscope, analysed them and then built the jacket and the pants from the ground up to match exactly with the reference". 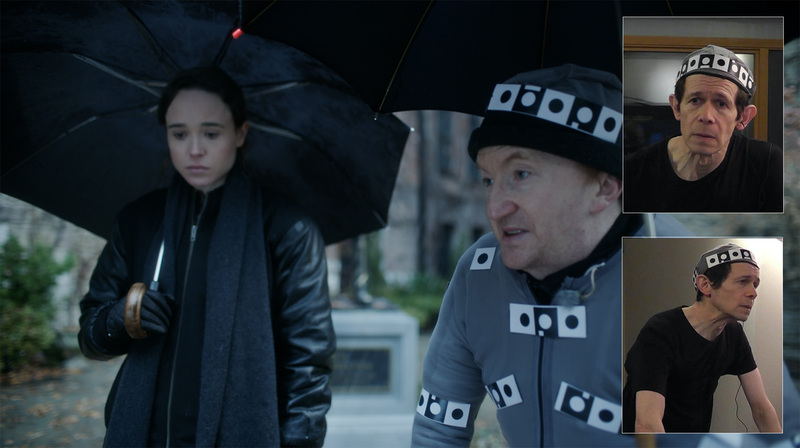 The team not only simulated the interaction between the characters touching the clothes or Pogo walking, but the new cloth also has some built in memory so it wrinkles and crumbles to avoid the garments from seeming too perfect. 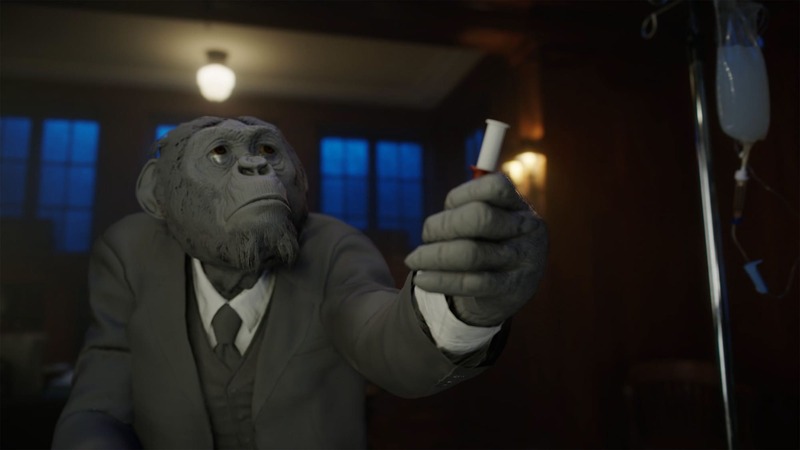 As Ken Hall was in many of the hero takes that were used, Weta also had to do remove and clean up work before compositing in the digital Pogo. 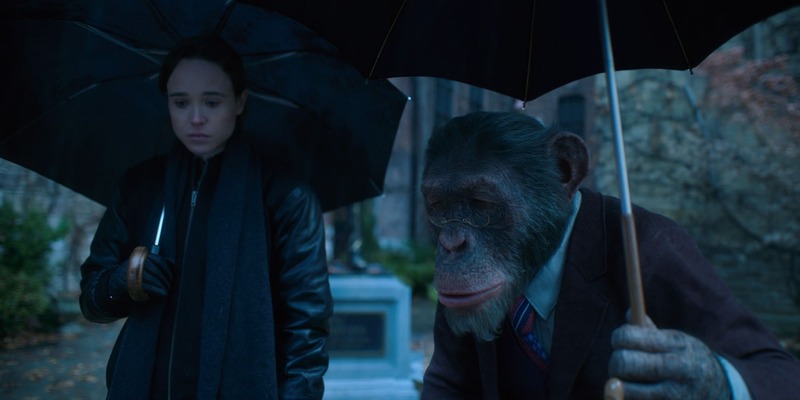 The most complex removal work was when Hall/Pogo was hugging a character such as "when Pogo's hugging Vanya (Ellen Page) in the first episode," white recalls. "That took a bit of work, integrating her hugging against him with the shape of his head and the jacket he was wearing." The jacket on Pogo was different from what Hall was wearing on the sound stage. Pogo was lit with both HDRs captured from set and creatively adjusted 'hero' lighting. The production LIDAR scanned the sets. 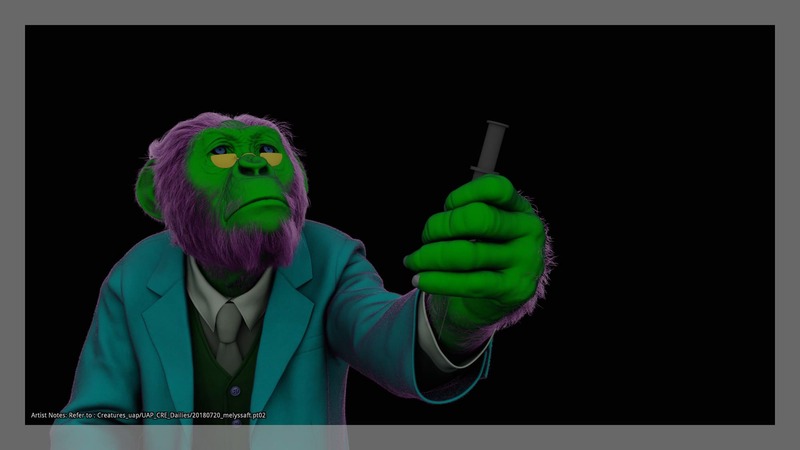 The Pogo shots were rendered in Weta's Manuka Renders. As the show was for Netflix, it was posted at 4K resolution from footage shot primarily on the Alexa 65. 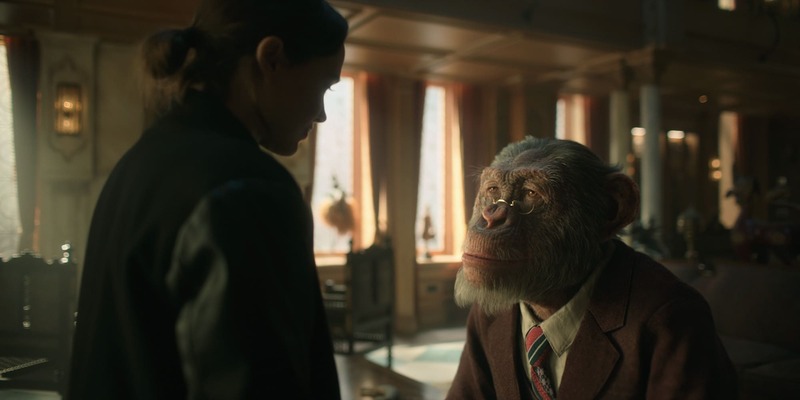 Unlike the Planet of the Apes films, The Umbrella Academy had a relatively short post-production period so more of the Weta pipeline had to be done in parallel said White, "for example, as soon as we got the plates with Ken Hall, we would match, move him and pass that off to the lighters to start working out the lighting. While they were doing this, we would still be working on animation. 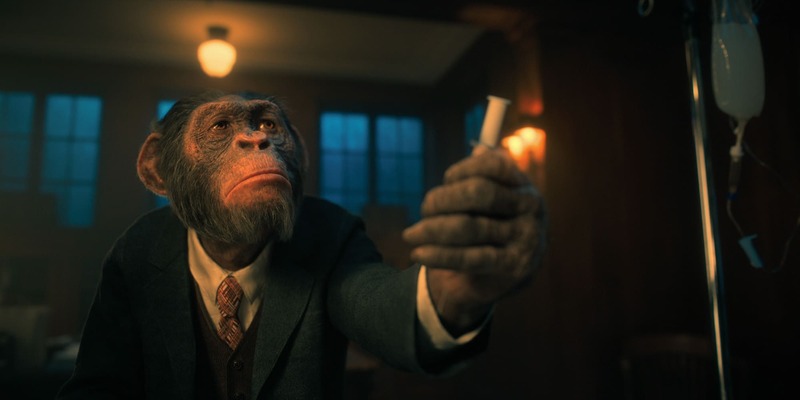 So instead of waiting till animation had been completed and then passing that to the lighters, we would start lighting immediately. As soon as the animation was ready, the editing team could drop it in, so all of departments ran in parallel to be more efficient." In all, Weta did about 150 shots in Series One. "To be honest, it was a really fun show" concludes White. "The crew that worked on this show had a fun time because we had problems to solve, and we could focus on making them look good. We had good tools and a strong history of making similar characters...It is a fun, quirky show and a really enjoyable project".